Get your fun on One-thirty-one. Strada statale 131 (SS131) is the major north-south highway in Sardinia. It has been upgraded almost completely to a four-line divided highway (dual carriageway), connecting the northwestern coastal town of Porto Torres to the southern port and provincial capital of Cagliari. It runs 230 km along the western side of the main Sardinian mountain range. Besides providing easy and fast access to many of the major towns such as Sassari, Alghero and Oristano on the way south. It passes through some spectacular rugged countryside and wide open spaces in the high plains. North to south or vice versa, the 131 is a very pleasant way to see the island. 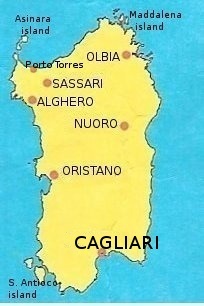 The road follows the route of the ancient Roman road, Turris Lybissonis [Porto Torres]-Caralis [Cagliari]. The road was modernized under Fascism in the 1930s and in the 1970s was rebuilt. The road is now also part of the Europe-wide road network with the number E25 (running from Hoek van Holland in the north to Palermo in the south) and is a Class A road. Because of the presence along the way of some intersections at road level with cross-traffic, the 131 is still considered a "limited accress" secondary road (unlike a true autostrada, with bridged cross-traffic and on-ramps); thus, I have heard that the posted speed limit is still 90 km per hour. I have also read that some people drive too fast to read the signs. Some in the Sardinian independence movement have proposed renaming the road Iosto (instead of Carlo Felice) after a famous anti-Roman Sardinian warrior. These same people also proposed renaming Punta La Marmora (the highest mountain peak on the island, named for Alberto La Marmora, 1789-1863, an Italian scientist) after Iosto's father, Ampiscora, who also gave the Romans a hard time. Both father and son died during the second Punic War. Such name changes are not likely to happen, though. Sardinia is unlikely to become a separate nation and, after all, the Romans did build the road in the first place.